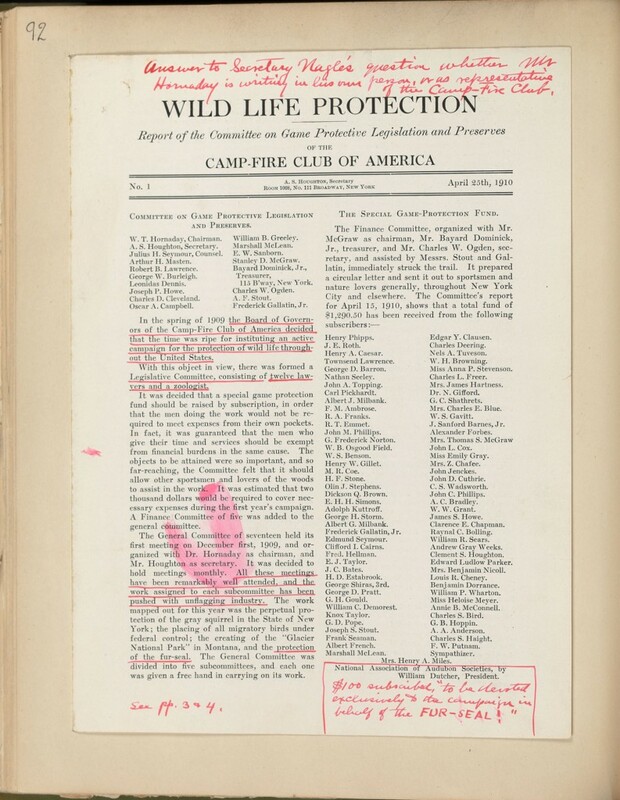 In the end, though, the CFCA’s virtues–among them “a camper’s freedom from restraint” and “no long speeches”–attracted several men who were also B&C Club members, including Theodore Roosevelt, forester and politician Gifford Pinchot, and artist Carl Rungius. 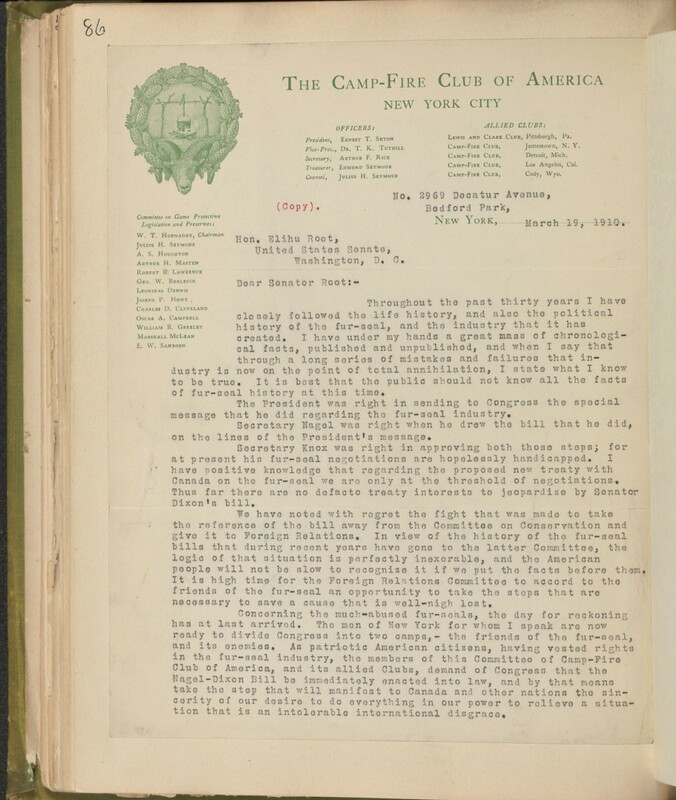 Text from early invitation to Camp Fire Club of America. Constantly learning from each other, they also became a strong foundation for each other’s crusades, as documented in the Hornaday Wildlife Conservation Scrapbooks. CFCA members worked closely, for instance, with Hornaday on his campaign to protect Alaskan fur seals. Wildlife Life Protection. 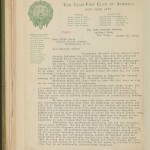 CFCA Report, 1910. In Hornaday Wildlife Scrapbook Collection, Vol. 4. WCS Archives Collection 1007. Hornaday used the Club’s name as a powerful leveraging force when writing to key decision-makers and political figureheads such as Senators James Dixon, Elihu Root, Charles Nagel, and George Bowers. Letter from Hornaday to Elihu Root, 1910. Hornaday Wildlife Scrapbook Collection, Vol. 4. WCS Archives Collection 1007. The accomplishments of the Club and its members held substantial weight with national figures, and Hornaday knew that representing himself as part of that team would bring his requests greater attention, even from President Taft himself. Letter from Hornaday to President Taft, 1910. In Hornaday Wildlife Scrapbook Collection, Vol. 4. WCS Archives Collection 1007. In this case, Taft was unswayed by Hornaday’s appeal–though Hornaday’s partner in the Fur Seal Campaign, Henry Elliott, questioned whether Taft had actually received Hornaday’s letter. 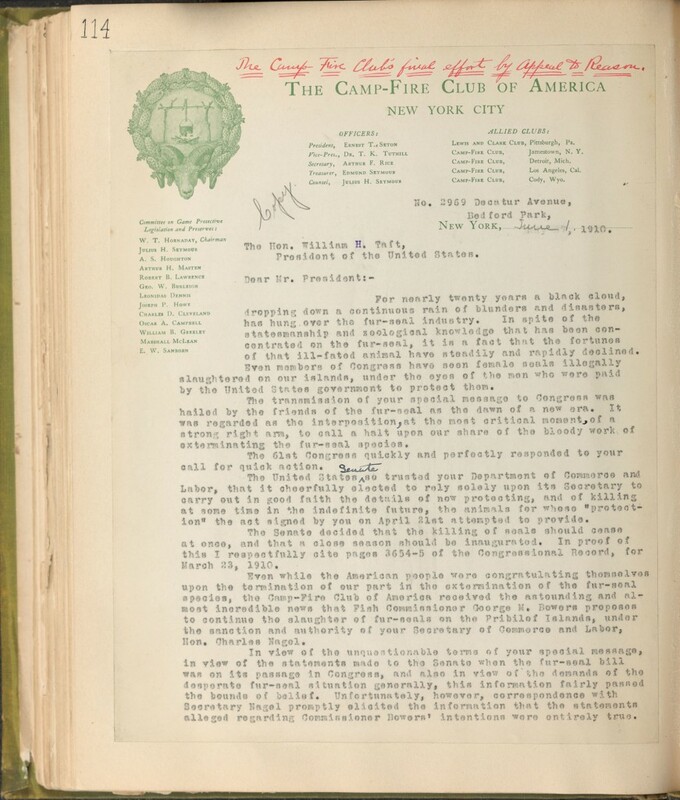 Today, the Camp Fire Club of America remains active in wilderness preservation, continuing the legacy that Hornaday began over 100 years ago.